In this gospel, Jesus heals the sick, casts out demons saves sinners, cleanses the temple, and does many other wondrous things. 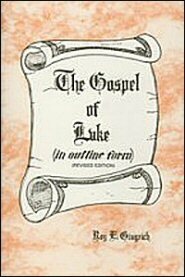 The gospel written by Luke offers salvation to sinners and fullness of blessing to saints. In this commentary on Luke, it is evident that Brother Gingrich has spent many hours of labor in prayer, study, and meditation. His commentary is clear in its thoughts, convincing in its explanations, and helpful in its applications. It is written in a style that makes it easy to read. Dr. Gingrich divides the book into five parts, beginning with “the Physical Advent of the Son of Man” and closing with “the Post-Resurrection Ministry of the Son of Man.” This fivefold division of the book helps the reader to organize and systematize the materials presented in The Gospel of Luke.